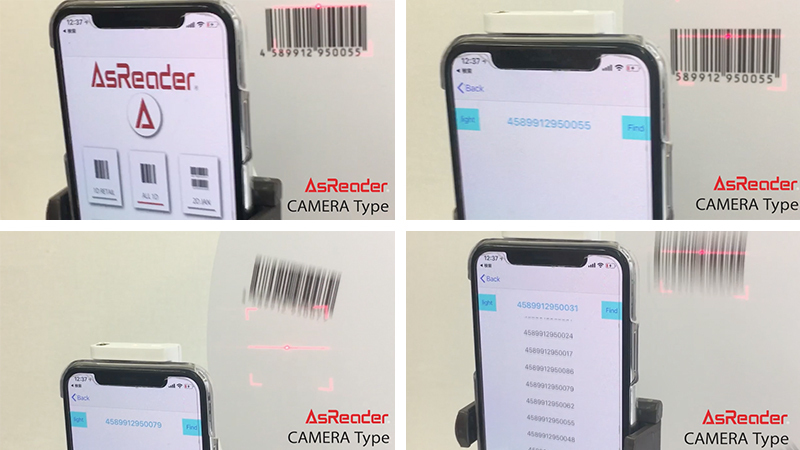 AsReader, Inc. announces its newest product today, “AsReader CAMERA Type,” a new, International Patent-pending solution, with a combination of next-gen software and a hardware laser-pointer that will alter the world of barcode scanning forever. Featuring high-speed, high-precision barcode reading that uses only the built-in camera of the smartphone with performance that truly holds its own against dedicated terminals. 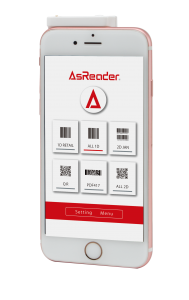 AsReader CAMERA Type allows smartphones to be used as professional barcode readers with advanced new software and by attaching a laser-pointer/aimer, enabling the user to instantly select just the desired barcode(s). Asterisk, Inc. (headquartered in Osaka Japan, CEO: Noriyuki Suzuki) is the parent company of AsReader, Inc. (Tustin, CA USA) and the creator, developer, and manufacturer of AsReader products which turn smartphones into professional IoT devices, using both barcode and RFID. This AsReader CAMERA Type product is a software-based barcode scanner for both Apple iOS and Android OS that achieves professional reading performance, comparable to that of dedicated barcode readers. 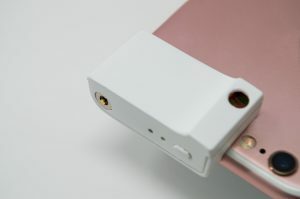 Released in Summer of 2018, this laser-pointer/aimer attachment allows the user to aim and scan barcodes without looking at the smartphone’s screen, allowing a barcode scanning experience similar to that of using a dedicated terminal with super high-speed scans. Smartphones and tablets have become remarkably sophisticated in recent years. The built-in cameras in smart-devices have developed to the point that some people speculate compact digital cameras may disappear. Despite physical advancements in higher-resolution (CMOS) sensor performance and the F-stop values of lenses, barcode decoding/analysis software did not evolve at the same rate. 1. The slow-speed that images from the smartphone’s built-in camera were processed. 2. The need to look at the smartphone’s screen while scanning barcodes. Existing barcode applications take too long for scans and are difficult to use. Asterisk spent over two years to develop this new software that can achieve ultra-high-speed barcode scanning from a built-in smartphone camera. Another disadvantage of scanning barcodes with a smartphone’s built-in camera is the need for the user to look at the phone’s screen to align the image of the barcode while trying to scan barcodes. An advantage of the old-fashioned, dedicated barcode readers is that they allowed the user to look at the actual barcode for scanning, not a screen. 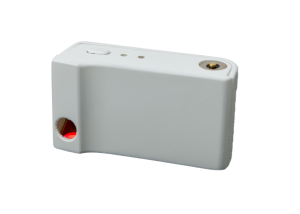 In order to solve these issues, Asterisk developed better software and a laser-pointer/aimer module attachment, for targeting barcodes. Asterisk has been disrupting the dedicated terminal market for years with its AsReader sleds and jackets that turn Smartphones in to professional readers in various fields, including manufacturing, logistics, retail, and healthcare. Now, adding this Camera-type to the AsReader line-up, an increase in utilizing smartphones’ built-in cameras for barcode scanning is expected increase dramatically worldwide. AsReader now offers both type of solutions, for various use cases. The barcode readers’ features can be changed depending on the type of attachment that is selected and the specific environment. Different options can include the applications to be used, the type/quality of barcodes in the work-flow, the presence or absence of a physical trigger-buttons, the continuous operation time requirements (battery-life), etc. The end user’s choice between AsReader Sleds/Jackets and Camera-Type will vary, depending upon their own environment and needs. The AsReader CAMERA Type can also be used “as a set” with a smartphone-mounted RFID AsReader, making it a multi-functional “Combination” device that supports both barcode scanning and RFID reading/writing from one device. Beginning in April of 2018, you can see this AsReader CAMERA Type in-person at exhibitions around the world, including RFID Journal Live in Orlando Florida, April 11-13, booth #1344. Scheduled for distribution from summer of 2018 (worldwide release). Fastest class of software scanner with a Class 2 laser-pointer/aimer module. Capable of scanning poor quality, damaged, and curved barcodes, even in dark environments. 1D Barcodes: JAN8, JAN13, CODE39, NW7, ITF, GS1Databar, and many more. 2D Barcodes: QR Codes, PDF417, DataMatrix, and many more. Simultaneous scanning of multiple barcodes is also possible.